Join us on our favourite walks in the lovely, varied and exciting scenery of Lakeland, or the majestic Continental mountains of the Pyrenees and Dolomites. Walking can be done at any time of year, and some of our most popular tramps take us into the winter fells of the Lake District and Scottish Highlands. The maximum number in any given party is six (6). Most of our walking is in the Lake District, but we also offer trips to the Isle of Skye, Isle of Arran and the Scottish Highlands..
As a general guide, our walks typically span a 7 to 8 hour day, and we will cover between 6 and 10 miles daily and ascend between 2,000 and 3,000 feet. Distance and height gain will be balanced, however, ensuring a pleasant pace, with time to appreciate our surroundings. 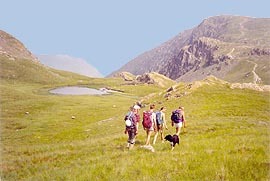 transport to and from the walks (but see specific courses and holidays for exclusions - e.g. airfares). Heading up towards High Spy and Maiden Moor on a sunny Lakeland day. Photo © Go Higher. 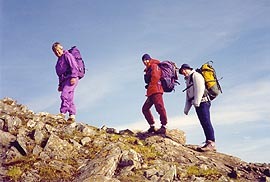 Walking the Cuillin Ridge, Isle of Skye, Scotland. Photo © Go Higher. [Inset Photo]: Traversing Great Gable to Beck Head above Wast Water (Lake District). Photo © Go Higher.